So we've talked about labour, and we've talked about sleeping and nursing. For the first 6 months of a baby's life, that's pretty much all you think and talk about, except for popping of course. But for the last 6 months, everyone reminds you about the all important event coming up, the baby's first birthday. "Have you started planning his party yet?" "What will the theme be?" "How many kids are you inviting?" "What flavor cake will you serve?" "What does Andrew want for his birthday?" are only a few of the questions people start asking you the moment they hear your baby has graduated past his first 6 months of life. And up until he was 11 months old, my response was "I don't know, I'm not thinking about that yet." Truth is, I'm a big believer in trying to live in the moment, so I attempted to soak up as much of how Andrew was at that moment, rather than living in the future of what he will be, or what his party would be like, etc. I spent a lot of time on the ground with him, playing peek a boo, handing him toys, crawling beside him, playing chase, and all manner of games while he was still limited in mobility. His first birthday was miles away from where I was, and I didn't want to touch the subject until it was almost time. Cause I'll be honest...I've been fighting the whole transition from baby to toddler, tooth and nail. If my Grandma had her way, Andrew would have stayed as a newborn, as he was in that first month, always sleeping and eating, so helpless and dependant on your touch. If I had my way, he would have stayed at 3 months, sleeping lots, and eating quite a bit, but able to interact with you, smile, and do a few cute "baby" things when he was awake. As he got further and further away from it lots of exciting stuff happened, but he wanted to be snuggled less and less. Now, he only wants to snuggle when he's really tired, or asleep completely. When he gets up at night to eat, I hold him after he's fallen asleep for a few minutes, just because it's the only way I ever get to do so anymore. 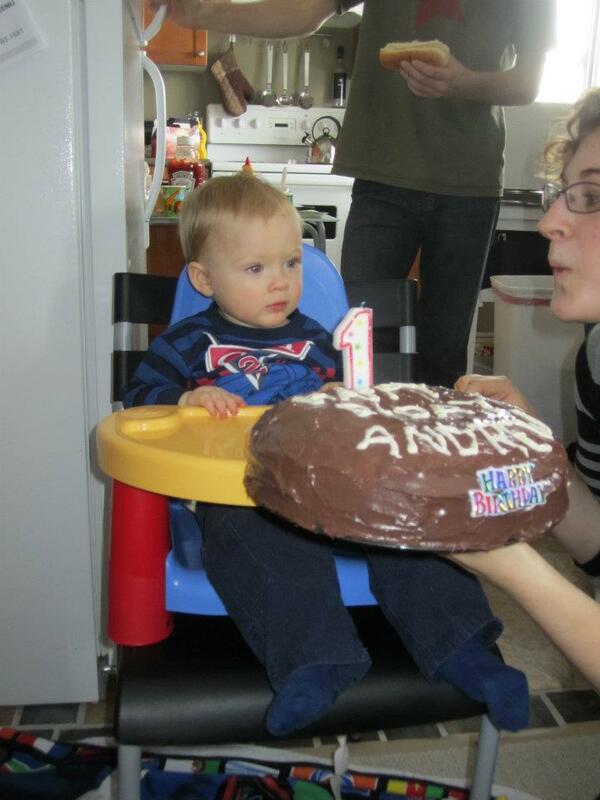 Andrew's first birthday was going to be a big affair. I knew that before I ever started planning it. He is the first blood grandchild in my family, and my mom has 4 sisters, 2 of which live locally. Neil's parents live locally too, and we each have 2 siblings. By the time cousins and friends and spouses of family were all factored in, we had 30 people squished into our living room/kitchen area. Yeah, 30 people turned up rather excitedly to see my little guy make that transition from 0 years to 1 year. We did a jungle themed party, with a monkey cake, and Andrew was shell shocked throughout the entire thing. My dad fed him bits of hot dog (which didn't really go over well) and Andrew managed to mooch small pieces of chips from probably every grown person there. But by far the most interesting part of the day was present time. For the entire party, the children present spent their time in the kids's bedroom, playing with toys and making a total wreck of the place. But man, they heard "presents" and they were out of there so fast, that bedroom ended up a ghost town. Every child then was gathered around me, salivating to get their hands on the gifts and help tear them open "for Andrew!" and then whisk the new toy off to be played with. Every child watched disappointed as I instead had to take the toy away from them, and put it in an ever growing pile on the chair behind me. I wondered what the kids must really make of another child's birthday party... they got to help unwrap the present, but they don't get to keep it? It must be very confusing for them. Most confused though, was Andrew. Between the paper that was handed to him, and the new toys that were placed in front of him for him to try to play with with all those people watching, and admire new clothes, he was looking mighty overwhelmed. I'm pretty sure he spent most of that time in my dad's arms, observing the mayhem below.